Look, I have never ever strapped on a pair of skis and plunged down a snow-covered slope. I blame this entirely on the elegant films made by Warren Miller, which convinced me that only supremely talented athletes could hope to ski without dying (maybe). Miller began making documentaries about skiing in 1950 and eventually completed more than 50 (?!). 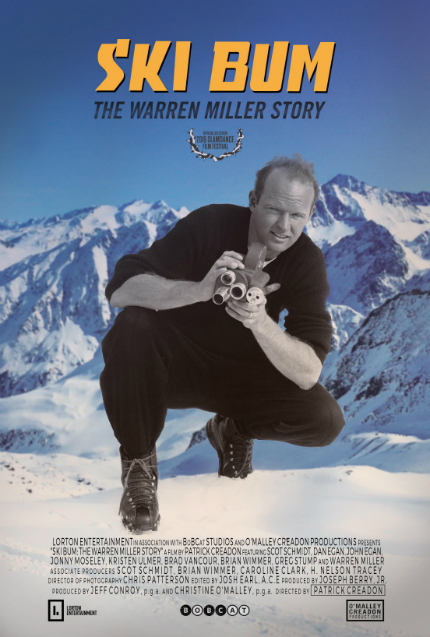 A new documentary about his life, Ski Bum: The Warren Miller Story, will enjoy its world premiere at the Slamdance Film Festival tonight as the opening night film. Here is the official synopsis for the film: "Directed by Patrick Creadon (Wordplay, I.O.U.S.A. ), Ski Bum: The Warren Miller Story explores the personal and professional life of director and athlete Warren Miller as well as the forces that drove him to the heights of success in the ski filmmaking world. "Featuring never-before-seen archival footage woven together with interviews from family, friends and colleagues, the film will give audiences a rare look at the man behind the films that kicked off ski seasons across the country for over 60 years. Also, contains the last on-camera interview with Mr. Miller before his death, and includes interviews with world-renowned skiers Scot Schmidt, Dan Egan, John Egan, Jonny Moseley, Kristen Ulmer and Colby James West." So if you are in the Southern Hemisphere and wishing it were cold enough to ski, watch the clip below for your vicarious thrill of the day. If you are in the Northern Hemisphere and wishing it were warmer, well, I can't help you, except to suggest you bundle up and watch the clip below. More information is available at the Slamdance page for the film, which will have two screenings tonight and another on Monday, January 28.